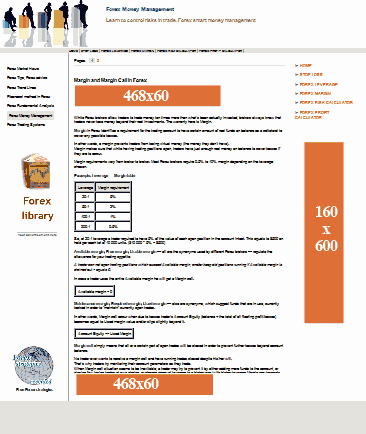 Forex Money Management offers advertising at a high quality website dedicated to one of the most important topics of Forex trading — money management. Our website currently receives around 7000 pageviews/month. With the introduction of a featured Money Management Calculator we expect a higher traffic for the new months. All banners are shown site-wide and get 100% of impressions generated by a website in one month. Forex Advertising is sold in co-operation with FXaa — Forex Advertising Agency. We work only with pre-paid fixed rate advertisements. All banners are previewed and tested before being placed on the website. An advertiser assumes full responsibility for creative materials displayed during the advertising campaign. Advertisers are able to change/replace banners and links to meet own advertising needs. To start advertising at Forex-Money-Management.com, please contact us to get details about available advertising spots.